Geography and History major at UW. 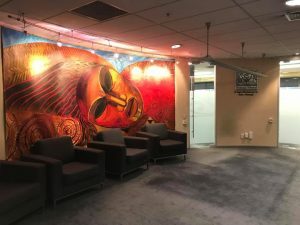 A mural of a Māori deity located in the Waitangi Tribunal lobby. This piece shapes the atmosphere of the Tribunal’s space. What does sovereignty actually mean? Before touring the Te Papa national museum, I believed the concept needed to be bound to legislation. However, our guide, Puawai Cairns, explained that sovereignty isn’t an event or destination, but rather, a process. This statement forced me to rethink my understanding of sovereignty, jurisdiction, and self-determination. If sovereignty was not an end point but was potentially a means of obtaining something, then what were the Māori people trying to obtain? I began reflecting on what I’d learned since arriving in Aotearoa. Earlier in the trip, we saw how the English version of the Treaty of Waitangi shaped Māori’s claim to sovereignty; as the new nation tried to create a partnership between the indigenous peoples and settlers, institutional biases and privileges marginalized and displaced the Māori peoples. Today, we met with the Waitangi Tribunal, which is the government institution employed to review how Parliament should respond to Māori claims regarding breaches in the Treaty of Waitangi. The Tribunal explained their goals and the processes to produce these reports. It seemed incredibly complex, strict, and limiting, especially due to how these claims are categorized. Māori can only make claims regarding injustices made after 1840, the year the Treaty was signed. In theory, this makes sense. Why would the Crown (a term for the New Zealand government) compensate for transgressions made before the partnership was declared? However, while this may appear logical, the historical injustices do not always follow this timeline, which complicates the Tribunal settlement process. Along with this, it was interesting to see a government program made to research Māori claims, which could support and give legitimacy to the Māori, have no legal power over the Crown. I left the meeting impressed with the Tribunal’s work, but feeling confused on how to perceive sovereignty. For the last event of the day, we met with High Court Judge Williams. Throughout our discussion, Judge Williams highlighted the idea that Māori needed to “integrate to perpetuate” in regard to establishing their sovereignty to protect and foster their culture and identity. Manuhuia Barcham addressed a similar idea in his paper titled ‘Politics of Indigeneity’ concerning proper acknowledgement, stating that problems arise because “the fact that the atemporality of difference predicated on the maintenance of a prior identity implicitly, and perhaps unintentionally, reduces group identity to a dichotomy of being or ‘non-being’, thereby effectively excluding recognition of the possibility of becoming” (139). 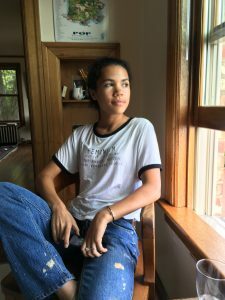 To perpetuate sovereignty as a process, a marginalized community must continue in a state of ‘becoming’ as a form of adaption, while striving to continuously achieve, display, and receive recognition for their self-determination and rights. Judge Williams emphasized that Māori identity is “to be related, to embody something.” This “something” not only represents their community, but also the space needed to foster their culture that the community derives from. Therefore, sovereignty for the Māori is possibly a mode of exercising power over, while existing within, the land that the people belong to. 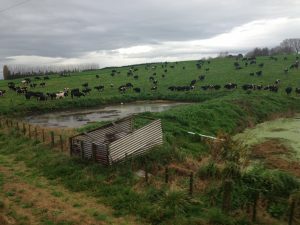 As I ended the day back at our hostel, I remembered a quote from Patricia Grace’s novel Potiki that explains how the environment embodies the Māori, their culture, and ultimately, their sovereignty, proving the importance of the Tribunal: “Remember that land does not belong to people, but that people belong to the land,” (110). This entry was posted in Our Experiences on September 7, 2017 by Racquel. Today, we took the scenic route to Wellington aboard the Northern Express for a ten-hour train ride. We traveled through tunnels, in the shadow of a mountain, and beside small industrial towns; all the while, we ate, listened to music, talked, and most importantly, slept. The lengthy trip was used for rest, bonding, and reflection as we looked onto Aotearoa’s beautiful countryside. A reoccurring feature of this landscape was the green grass used as pastures for grazing cows and sheep. Animal agriculture was so prominent throughout the ride that I was able to comprehend how vastly outnumbered humans are by sheep: 29.5 million to 4.6 million. It began to strike me as odd, how have these non-indigenous animals become such a staple in the country’s geography? Unfortunately, the answer to that question is quite layered involving both the Treaty of Waitangi and Western ideology. Throughout this trip, we have learned the effects of having two separate founding national documents; the Māori’s version of the Treaty is a completely separate piece of work when compared to the British version, ultimately causing disparities which left the nation, specifically the Māori peoples, with intergenerational traumas. As the country grew off of the British version of the Treaty, the Pākehā’s (non-Māori) needs and values were cemented into the nation’s identity. The Māori peoples became marginalized as the partnership outlined in their version of the Treaty was not upheld. Due to this structure, the Crown was able to “buy” Aotearoa’s lands and level them in order to make space for agrarian traditions and the Pākehā. The polarity between the grazing fields and natural, thick forests is stark and highlights the settler colonialism—immigrating to embody the space and spatial interaction of a location while imposing a foreign culture—etched into the environment. However, since Aotearoa and its entities were not empty, the Māori were left without the rights detailed in their Treaty. I was reminded of the Māori’s fight for sovereignty as I looked out onto lands that were mostly taken with unjust methods such as confiscation or purchasing land for less than it’s worth. This entry was posted in Our Experiences and tagged Environmental, representation, sovereignty on September 2, 2017 by Racquel.